Cookies in the usual sense are baked once, that is, the dough is made, formed into pieces and into the oven. Are there any cookies that look different from the standard ones, and they put them in the oven twice? Yes, this is the so-called biscotti cookies, an Italian delicacy, which is easy to prepare, and then surprise their relatives and guests. 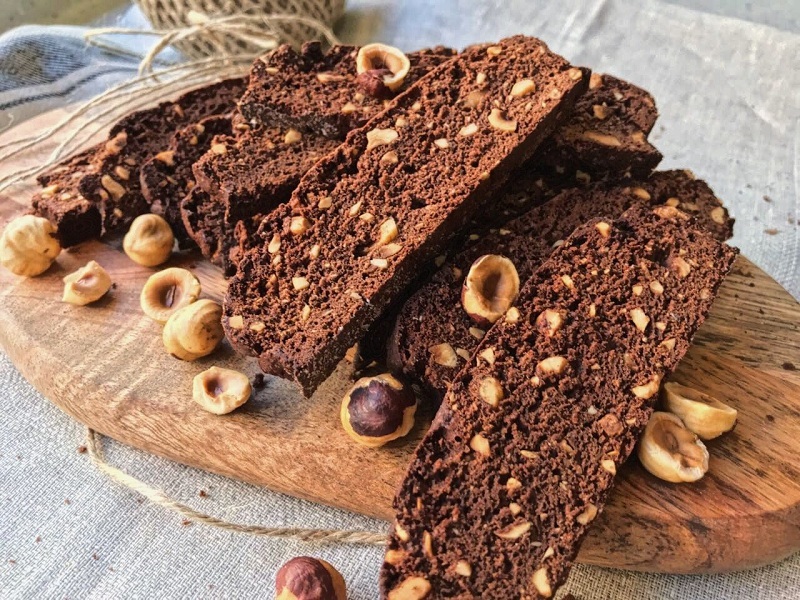 The main principle of making biscotti cookies is to make long loaves in the form of a loaf, then they are cut into slices and dried to a crisp state, this condition is observed in all recipes. 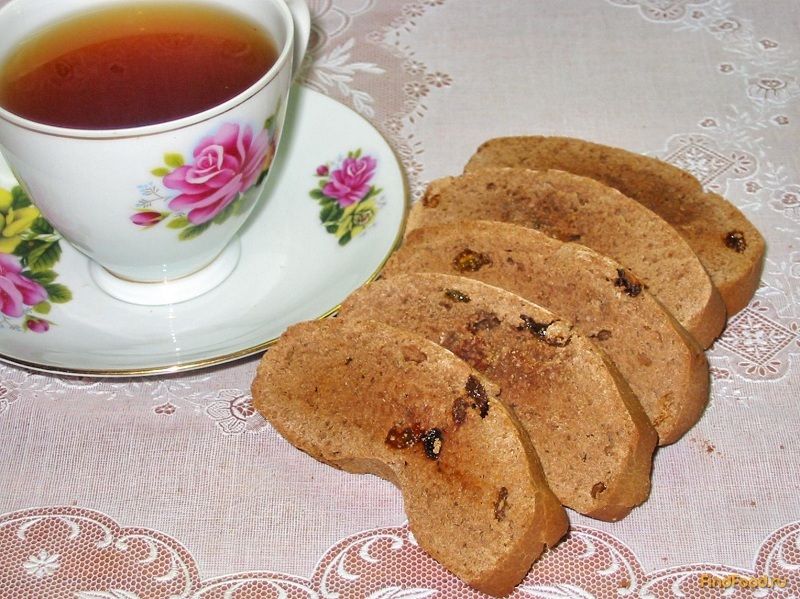 Biscotti seems dry, even harsh, but here I must say about the second principle in relation to such a dish – it is served strictly to drinks: tea, coffee, even wine are the companions of this cookie on the table. The origin of the name is a moot point among culinary specialists. 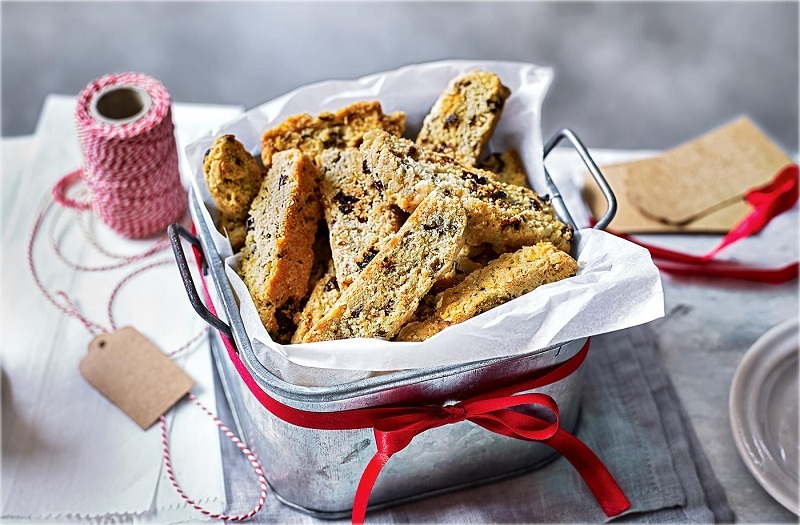 The first opinion: once biscotti was a secondary product of the processing of stale biscuits – they were cut into pieces and dried, turning them into croutons. That is, the word “biscotti” allegedly – a derivative of the word “biscuit”. Second opinion: “bis” means twice (double heat treatment), “cotti” – in fact, there are cookies, so “biscotti” came out. They say that Christopher Columbus adored him, and took with him on his first journey huge crates full of these cookies. The legendary traveler did it for a reason: you can keep biscotti in a sealed container for a long time. Arguing about the “correctness” of this cookie, similar to crackers, can be infinite, but it will be more useful to make it yourself and try it. 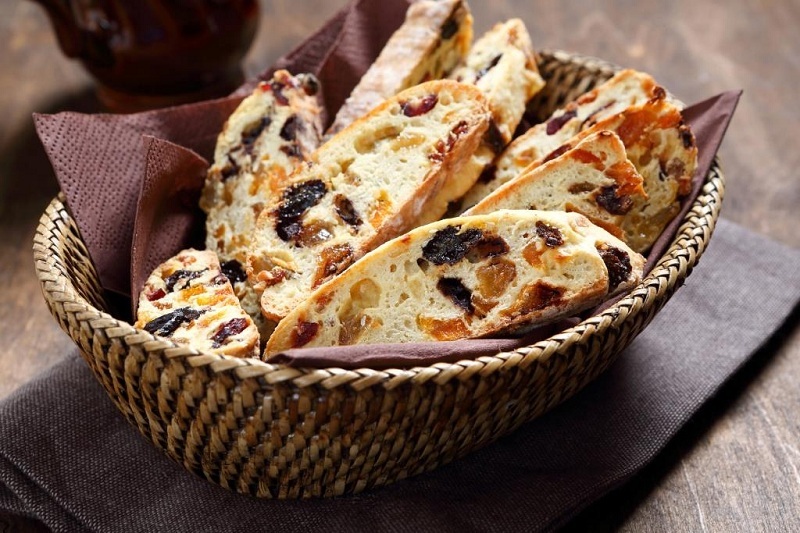 The simplest biscotti cookies are baked with two ingredients in the composition – it is raisin (seedless raisins) and walnut. Another nuance: in many recipes, they write that butter is needed, but it can be replaced with a spread completely without loss of taste – a product already made in our stores that consists of butter and high-quality margarine in equal shares. on the tip of the knife – vanilla. We leave the oil in the evening outside the fridge when we are going to bake the biscotti in the morning. If you need to make biscotti cookies urgently, then melt the butter (or spread) in a water bath and let it cool. Beat eggs into foam, add sugar there, continue to beat at maximum speed until sugar dissolves to the last grain. In a mixture of sugar and eggs pour half the flour, stir, add butter to the liquid (so far) dough, mix with a mixer. Grind kishmish and nuts (not for long) in a mixer. Grind not for long, into pieces, and not into porridge. Add them to the watery dough, pour in the vanilla there, extinguish quite a bit of soda with vinegar, pour it into the dough too, mix thoroughly. Now turn the second glass of flour, knead the dough with your hands. The baking sheet can be greased with butter (if Teflon), simple we lay the culinary parchment. On the baking sheet form two long “bar”. We put in the oven, which warmed up about 200 degrees. We take out the pastries and immediately cut into pieces, slightly obliquely or smoothly, a matter of taste. The heat at the oven decreases a little. Pieces of cookies evenly distribute on the baking sheet and again in the oven to dry. The time spent in the oven depends on the thickness of the cookies: if cut into 1 cm thick, 3 minutes is enough, one and a half cm – you need 5 minutes. Ready biscotti should be allowed to cool under a towel, then you can put them in a storage container, or serve at the table, where they are waiting for guests, tea and coffee. Yes, this cookie can be made not only from wheat flour but also replacing it partially with rolled oats. The oil for Hercules biscotti should be liquid and slightly hot – we melt it in a water bath. Quite a bit we let it cool down, pour the oat-flakes into it, mix it thoroughly. Then we deal with eggs and sugar. Again: first, beat the eggs, and then continue to beat them with sugar. The resulting mass must be added to the already warm mixture of oil and rolled oats, and stirred with a mixer. It turned out while semi-liquid dough, pour almonds into it, mix it evenly. You can now add and vanilla. We add half of the flour to the dough, mix the soda with vinegar-quenched soda (mix it again), then add the second half of the flour and finally mix it with our hands. Next – the standard process: the formation of loaves, baking them, cutting into slices, drying. Biscotti biscuits, when cut into pieces, give a lot of crumbs, and Hercules – even more, but it’s not scary, it should be. Just take a very sharp thin knife, they just whole almonds will be well cut. 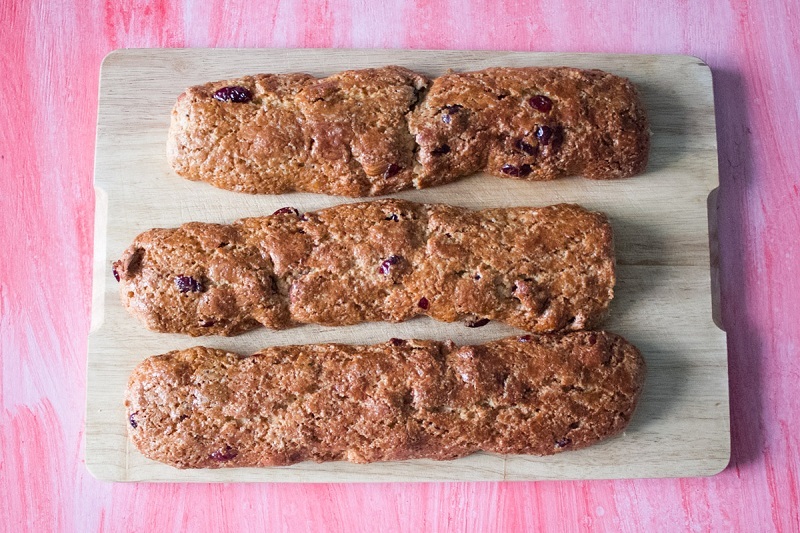 Honey is added to standard products (flour, eggs, sugar) in this recipe – it will make biscotti similar to gingerbread and more high-calorie. The last ingredient can be prepared in two ways. First: a standard-sized black chocolate bar is rubbed on a fine grater. The second way: we buy on the weight of 100 g of chocolate with small “plaques”, we grind them in a coffee grinder or a mixer. Beat the eggs, beat the sugar into them until completely dissolved. Add soft butter, work again with a mixer. A teaspoon of honey is well mixed with a mixer in the resulting mass. Pour half the flour, stir again, add the nuts, spread them out with a spoon evenly over the dough. Soda on the tip of the spoon quench with vinegar, pour the second half of the flour and chopped chocolate, knead the dough by hand until the end. Making loaves bake them. With chocolate, biscotti is baked faster, besides, it will not be seen how it starts to turn red – we carefully look at the dough while it is in the oven so as not to burn. Remove, cut with a sharp knife, dry. The photo shows that the cookie came out dark, but the photo does not convey a wonderful nut-honey exquisite aroma! Nuts in such biscotti cookies are placed whole (as in the recipe above), but you can grind them. In cooking, there was a new direction, which has become a real panacea for those who are harmful to gluten, or if there is a desire to use it minimally. This is a gluten-free diet – it helps asthma sufferers, makes life easier for allergies. Also, doctors strongly recommend switching to a gluten-free diet for children with autism. This recipe is for those who for some reason cannot (or do not want) to eat bread products from wheat flour. any dried fruits, nuts, raisins (or a bit of everything) – half a cup. Preparation of eggs, sugar – the same: first, beat the eggs, then with sugar. There pour olive oil, mix with a mixer at high speeds. 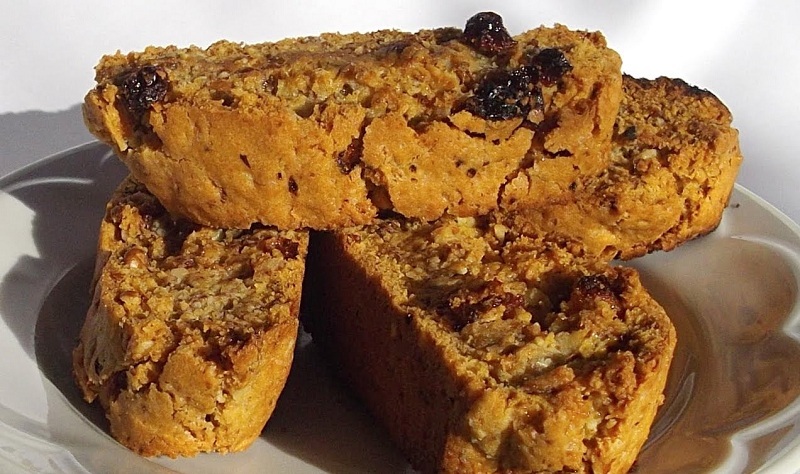 Olive, not creamy – because with gluten-free flour, it is better to “be friends”. Add flour, xanthan, baking powder, dried fruits, and nuts, interfere with your hands. This time it is better to use baking powder, and not soda with vinegar: soda and vinegar “work” for loosening with wheat flour, and our flour (without gluten) does not work well with them. Do not forget to add vanilla. 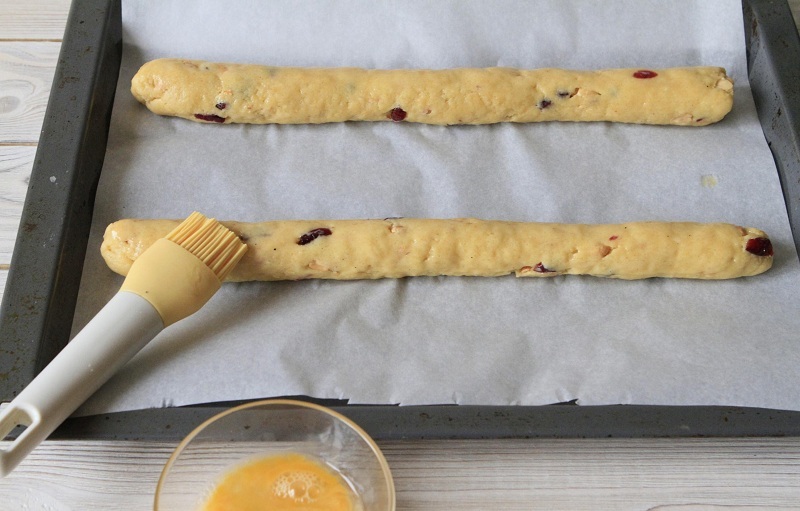 The dough will come out very sticky because to form long bread over wet hands. Bars are well lubricated with whipped yolk or sweet water: gluten-free biscuits baked without lubrication pale. Then – according to the standard scheme: baking, cutting, drying. Such cookies can be eaten and people without health problems – it is well absorbed, and xanthan is recognized as a completely safe additive, which reduces the calorie baking. 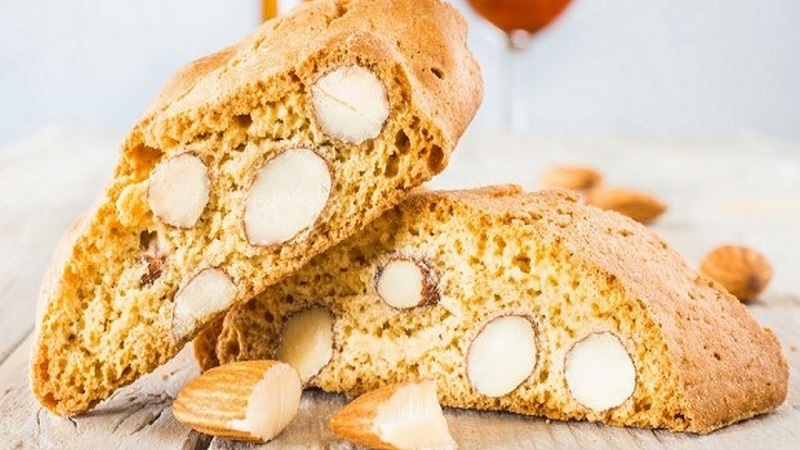 Biscotti’s “great-great-grandfathers” were once in the days of the Roman Empire bread with almonds – they were baked twice to dry completely and given to soldiers on hikes. Then sweet biscotti entered the menu at the imperial court, and among ordinary residents. He was valued for a delicate taste, a wonderful combination with wine and for the fact that they are “long-playing” – they keep the taste for many weeks, they do not get stale. 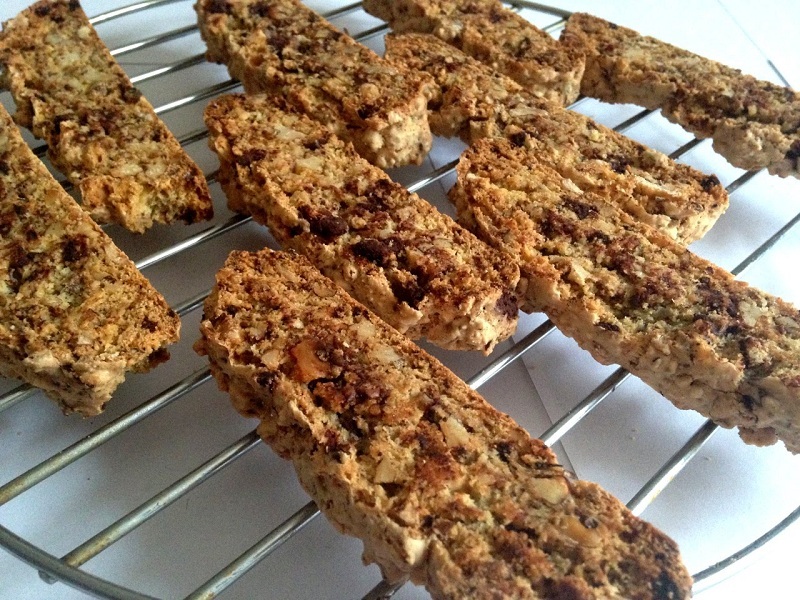 The philosopher Pliny wrote that correctly prepared biscotti can be stored for a couple of centuries. Do not do “blanks” for great-grandchildren of biscotti, of course! But you should always have cookies at home that won’t spoil!